If you have been confounded by 7-inch tablets that simply felt too small and saw no attraction to the 9 or 10-inch tablets, Alcatel hopes you will give its 8-inch offering a try, the One Touch Tab 8 HD. Instead of competing directly with the other high-end 9-inch-plus tablets out there, Alcatel thinks it found a happy medium with the Tab 8 HD. 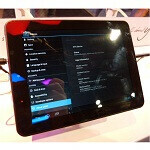 Like its 7-inch sibling, the 8HD is running Android Jelly Bean through the same dual-core 1.6GHz ARM Cortex A9 processor. The display is 1024x768. There will be options with regards to on-board memory, 8 or 16GB of storage, plus microSD expansion. 1GB of RAM is available. There will also be two main cameras offered, either a 2MP or 5MP unit. The front camera is the same 0.3MP found on the Tab 7HD. Connectivity is Wi-Fi, 802.11 b/g/n. Availability and pricing for the Tab 8HD was not announced. 1024x768 is HD. It only needs to be 720 to fit the bill. 1080 is full HD. for this tablet? not bad, but if they want to enter the bridge of competence, they must make the dual core a quad core processor and the resolution a bit higher.. This is the way tablets should be. Micro sd, micro hdmi, and micro usb should be standard on everything. I think making the device with two internal memory option of 8GB and 16GB is useless since it has and expandable memory slot. My bet is most will be going for the 8GB.